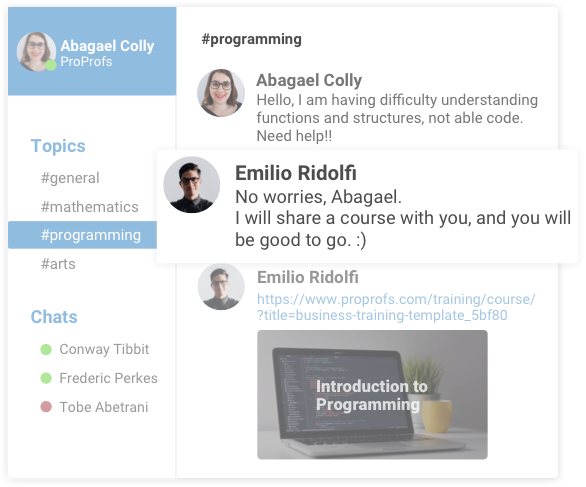 Collaboration software by ProProfs helps you launch surveys, in the beginning, middle or at the completion of the course to get valuable feedback from learners. Implement the feedback shared by your employees and enhance the performance of your courses. Get to know their concerns through surveys and accordingly refine your courses to address the issues. Give them complete anonymity so that they can freely put their views across. Ensure a higher response rate by providing learners with incentives to fill the survey. Connect with employees in your online classroom easily. Make announcements related to the course and keep them informed of any changes. You can also make announcements in multiple classrooms simultaneously. Edit or delete the announcement if need be. Share an interesting video or an article and keep learners engaged in the course. Keep your course exciting and maintain the interest of learners by making regular announcements. Empower your employees to access information about courses on-the-go, anytime and from any device including mobiles, laptops, and tablets. Let them share knowledge and collaborate with their colleagues over a single platform. 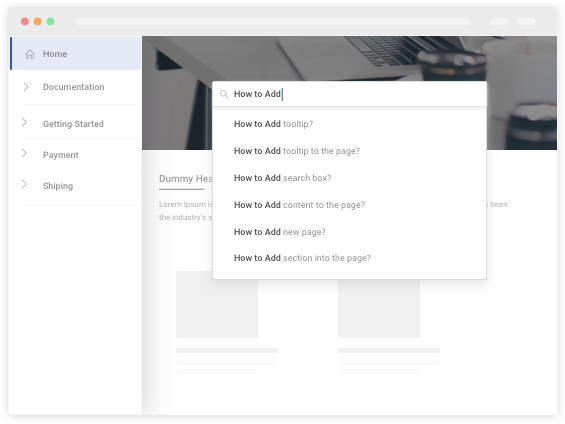 Provide them with relevant content and page-related suggestions, whenever they search for information. Give them a seamless and smooth search experience. 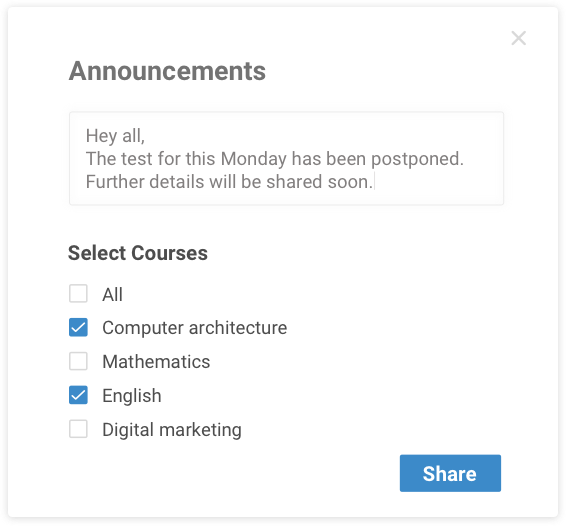 Allow your instructors to share courses with one another and collaborate in real time, using our team collaboration tool. Club the courses into a folder and share it with multiple trainers at the same time. Get suggestions from instructors working across various departments and refine the quality of your courses. Provide your employees with a central platform where they can connect with fellow learners as well as trainers and ask any doubts or questions they may have regarding the subject. Our corporate collaboration tool allows you to train large batches of employees or learners spread across the globe. Select instructors to manage training in different locations and allot group administrators for organizing large batches of learners. Centrally manage your squad of trainers and learners. 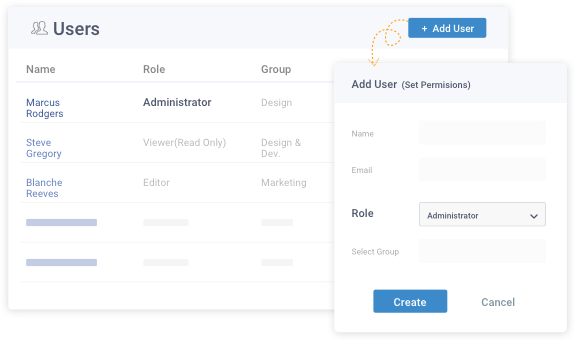 Assign instructors and group admins different roles like Super Admin, Group Admin, Instructor, etc. Give them read-only or full editing rights based on their roles.